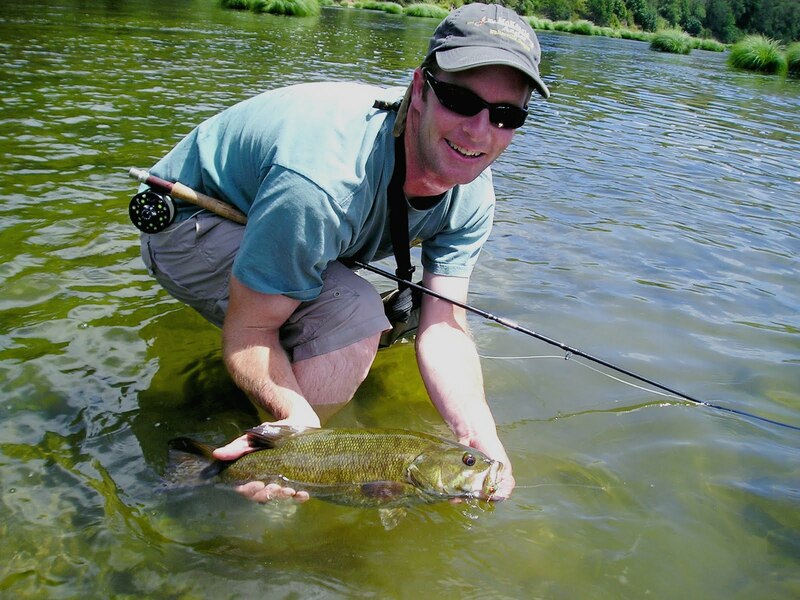 Brian Marz has been involved in fly fishing since he moved to Oregon in 1993. 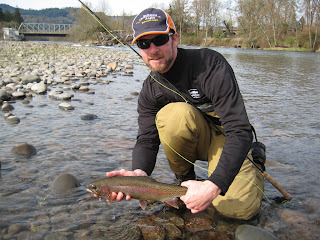 One of the first things Brian did was to get a fly rod when he moved to Eugene, and then the fly fishing pursuits began. After learning the ropes with rainbows and cutthroat trout on the McKenzie and upper reaches of the Middle Fork Willamette, it was time to get into steelheading. Soon a new passion was developed, and chrome hunting for these seagoing rainbows was in full force. The same happened for salmon species like Chinook, Coho, and Chum; where Brian spends much of the time spent in the fall months targeting these fine fish. After getting his fill of chrome sea running fish; the bucket list for other fish species started. Warmwater fish like largemouth bass, smallmouth bass, bluegills, & other sunfish reminded him of fishing on the east coast as a youngster. Saltwater flats fishing, stalking the mazes of mangroves, or searching the bluewater for pelagic species are all forms of fly fishing Brian would drop everything and take off for on any occasion. In the coastal Pacific Northwest Rockfish and Lingcod became a passion of Brian, and figuring out the tricks to getting into these bottom-fish with a fly rod soon became an obsession. Whether it is stalking a weary carp on a gravel bar flat on the Columbia River, or swinging a floating line for the tug of that steelhead Brian is game for it all. 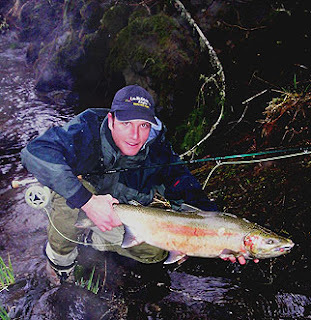 Brian got his start in the fly fishing industry as the manager and head guide of The Walterville Fly Shop located in the McKenzie River Valley. After a few years at that, Brian started his own shop called The McKenzie Angler at the former location that he managed. Brian built up the business and guided all of the time, while also teaching classes on fly fishing and fly tying. After four years, Brian decided he wanted change in life and so he closed the doors of the shop and relocated up in Portland. It was time for the next chapter in life, and Portland seemed to have plenty of fly fishing opportunities. 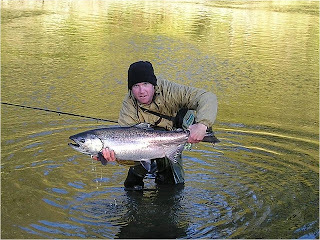 In March of 2010, Brian was hired by the super renown Kaufmann's Streamborn Fly Fishing shop to help run the shop, maintain the web site/s, instructing classes ranging from fly tying to spey casting techniques, and guiding. It turns out that guiding up in the Portland area has its great advantages, and while the McKenzie and Willamette Rivers are farther away than before; the trade off is that there are many more rivers to choose from around Portland than there was before. Many more steelhead rivers to choose from, and they range from coastal to inland rivers. Tons of locations to choose from and you can often find good colored water with good levels no matter what the conditions are (well most of the time ). In April of 2011, Kaufmann's Streamborn closed their doors, and it was time for another change. With all of the wonderful fly fishing opportunities within driving distance of Portland Oregon, and the love for fly fishing, Brian decided to become a full time guide. Orvis Portland opened up in November of 2010, and Brian was lucky to gain a part time position helping out in the fishing department. This was a great fit; since the full time guiding was also aligned with being an Orvis Endorsed Guide. What better of a job can someone have than to be around the rivers all of the time, and to know what the latest and greatest fly fishing opportunities that exist at the current times. Fall is one of Brian's favorite time's to target the McKenzie River's trout. During October of 2013, Brian had another chapter in his fly fishing industry life occur. He was promoted to the Fishing Manager at Orvis Portland. In June of 2014 Brian decided he would hang up guiding; so he could focus on his full time position with Orvis. He has been happy hanging out with his wife Nikki on his days off, where they get to enjoy the water targeting everything from resident trout in the McKenzie to big chrome bright Chinook fresh from the salt to those aggressive rockfish right out in the saltwater. Brian enjoys carp hunting with a fly rod as a spring and summertime activity. Brian has been in a wide variety of publications throughout his fly fishing career; so when you have a chance try to pick one and check it out. *** Brian also does presentations (videos, slide shows, etc) for fly fishing clubs and various organizations around the state; so if you are interested, feel free to contact via email or phone regarding one for your club, organization, etc.